We received an enquiry via the Club website from an enthusiast in Canada who was in the process of rewiring his 'Seven'. He was hoping to use the existing wire sizes as a guide but unfortunately the previous owners seemed to have used whatever wire which came to hand. He had a circuit diagram but no colours or wire sizes were indicated and as he was not an electrical expert he was having trouble sizing the wires. It certainly wasn’t a daft question at all. Wire sizing is a mixture of the number of strands in any one wire, the thickness of any one strand in mm and the total cross sectional area in square mm. I blatantly plagiarise Auto Electric Supplies' website, (http://www.autoelectricsupplies.co.uk/product/66/category/11) as it is both accurate and informative. 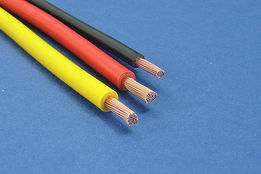 General purpose low voltage cable for use in automotive and marine applications in temperatures up to 70 deg C. Consists of conductors of stranded copper wire which are PVC insulated. Cable descriptions give the number and size of cable strands and the total cross-sectional area of conductor. For example 14/0.30, 1.0mm2 refers to 14 strands of 0.30mm diameter cable giving a total cable conductor area of 1.0mm2. Where two colours are indicated (eg. Blue/Black), the first is the main colour and the second is the tracer colour. 9/0.30 : Side/tail lamps, indicators etc. 14/0.30 (010102): Side/tail lamps, indicators, fog lamps, general wiring. 28/0.30 (010103): Head lamps, wipers, screen heaters, petrol pumps, etc. 44/0.30 (010104): Charging circuits, main feeds. 65/0.30 (010105): Heavy duty charge circuits, alternator feeds. Now, for your 'Seven', you can be a little more penny pinching with wire types if you have converted to 12V, simply because the current (Amperage) of each load will be lower than the same load for 6V. Remember that 6V systems suffer worse for drops and losses than 12V. Therefore, use the “typical uses” table, but if you are still using 6V, choose one wire size thicker than stated. 0.65mm2 5.75A All the lights except the headlight; dynamo F circuits, petrol gauge, trafficators. If you want to save a watt or two, consider LED tail lights. I hope this helps. Oh, one last tip, there is a sort of standard for wiring colours that is shown in the “Companion”. Keeping to it (or something like it) makes fault finding easier!. Resist the temptation to buy a large reel of one colour! !